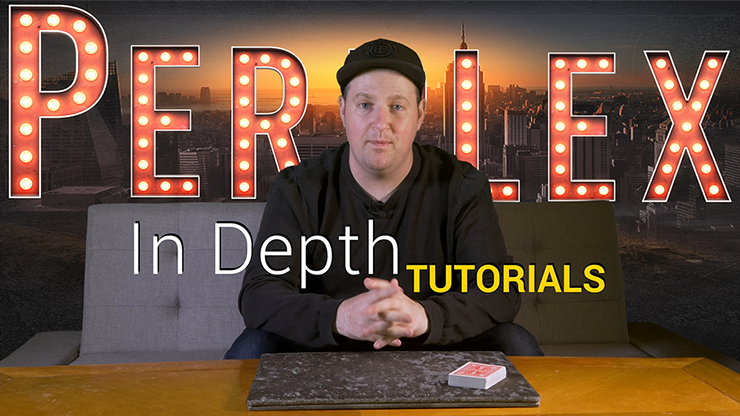 Perplex is a card move by the underground card magician Criss Smith. You receive a well produced DVD with the creator performing and explaining the moves as well as 4 effects. Essentially,Perplex is a visual card change. The top card of a deck is turned face up and held at an angle on the top of the deck. Its full face can be seen. It is not the card the performer is looking for. With a wave of his other hand over this card, it visually changes into the correct card. This card is turned face down on top of the deck and can immediately be dealt out to any member of the audience for examination. The change is very visual and appears to be magical. Criss also teaches a version two of Perplex. This is a non-visual card change. It is used to secretly exchange one card for another. It starts off the same as in the first version. Instead of the hand waving over the turned over card, the other hand with the deck and the card is turned palm downwards, and the protruding card is taken out and placed face down on the table. It changes into another card. As a bonus, Criss teaches his Octopus Force. A deck is shuffled using the Hindu Shuffle. A spectator calls “stop”. The card stopped at is flipped over face upwards – this is deemed as the chosen card. The other half of the deck is replaced on top and the force card is seen face upwards jutting out in the middle of the deck. This force requires some work to get it looking right. A deck is shuffled and a spectator calls “stop”. The card stopped at is shown and replaced back in the middle of the deck. The top card is turned over to show a different card. With a wave of the hand, it visibly changes into the chosen card. It is like a visual ambitious card. The method taught requires a duplicate card. This seems a little weak to use a duplicate especially for a DVD such as this one that teaches sleight-of-hand. Criss does mention the possible use of the “Butterfly Pass” instead of depending on a duplicate card, but he is not obliged to teach this marketed technique. A card is selected and signed across its face. It is turned face downwards and inserted back into the deck. Immediately, the deck is spread face downwards and the signed card is seen to magically turn face upwards. This signed selection is turned over to show that its back has now changed to a completely different back design. Two red jacks are set aside. A card is freely chosen and returned back into the deck. The 2 Jacks are inserted into the deck face upwards. The deck is spread and one card is now seen between the 2 red Jacks. The sandwiched card turns out to be the selected card. This is like a varation of the efffect “Will To Gleason”. 4 Aces are put to one side. A card is chosen and is inserted face downwards into a face up deck. The 4 Aces are shown face up. Magically, one card turns face downwards. It can be deduced from the rest of the face up Aces that the suit of this Ace is the same suit as that of the chosen card. The face down Ace is turned over to reveal it is indeed the chosen card. The only face down card in the middle of the face up deck is turned over and found to be the Ace of the same suit. The DVD is well produced and has an excellent menu to help you maneuver to the various sections in the DVD easily. The 2 versions of the Perplex move are excellent moves to learn and to add to your card magic arsenal. Version 1 is a visual transformation of a card while version 2 provides a very good invisible switch of a card. 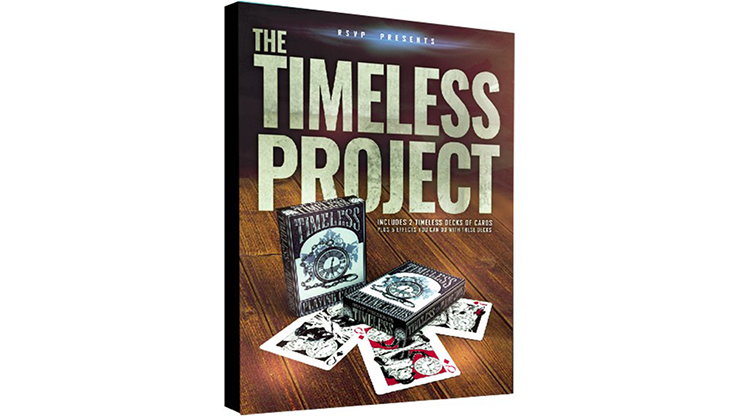 If you love card magic with a novel twist, you will like “The Timeless Project”. It is based on a beautifully designed deck of cards produced by RSVP Magic called Timeless. In this deck, all the 12 court cards contain a drawing of the face of a clock. Since there are 12 cards, each court card features a different hour on its clock face. The back design depicts the mechanical clockwork used in operating the clocks. Included in this deck are several specially printed cards that can be used for magic. “The Timeless Project” gives you 5 different effects you can do utilising the Timeless deck. What you receive is not one, but 2 Timeless deck. The first deck is the regular Timeless deck as mentioned, while the other Timeless deck has the entire deck specially gaffed. A well-produced DVD that contains all the instructions comes together in the package. TIMELESS CLOCK – this is the classic “clock” effect given the Timeless treatment. A spectator thinks of her favourite time and secretly takes that number of cards from the deck. With the remainder of the deck, the performer takes 12 cards and arranges them in the form of a clock face. He proceeds to divine the favourite time thought of by the spectator. The card at the selected time happens to be the only card that contains a written message to refer to the Timeless deck. The performer takes out the Timeless deck and one card is found to face the other way. This card is the court card that depicts the chosen time of the spectator. TIME WARP – using the Timeless deck, a spectator selects, say, the Jack of Spades, which features a clock at 3 o’clock. This card is placed face downwards on the palm of her hand. Her other hand is brought quickly down onto this hand, trapping the card inbetween. Unfortunately the force of this movement breaks the clock. When the card is turned over, the clock on the Jack of Spades is now shown shattered! She is told to move back in time and reverse her action. She raises her other hand and the clock on this card is now found to be completely restored back to the original 3 o’clock. The spectator chooses another card – this turns out to be another court card, say, the King of Hearts which features a clock at 10 o’clock. This card is turned face downwards, and is caused to travel ahead in time. When it is next turned face upwards, instead of 10 o’clock, the clock now shows 3 o’clock, a perfect match to the original time chosen in the first card. JUST A SECOND – a card is chosen from the Timeless deck. It shows the King of Hearts which features a clock at 10 o’clock. It is placed face downwards to one side. The winder of a wrist watch is pulled out and rotated to show that it moves the hour hand of the watch. The watch is turned face downwards and a spectator rotates the winder freely and stops at any point she wishes. She then pushes in the winder to lock the time. The performer says he has influenced her to stop at the same time, 10 o’clock, as that shown in her chosen card. When the watch is then turned around, it does not show 10 o’clocl, but a different time: 3 o’clock. Her chosen card is turned around. The same King of Hearts now features a clock set at 3 o’clock instead of 10 o’clock! DUEL TIME – 2 decks of cards are displayed: a common deck of cards and a Timeless deck of cards. A spectator states her favourite hour. One card is found to be facing the other way in the common deck. It is a court card, say, Queen of Diamonds. From the Timeless deck, the Queen of Diamonds is taken out and shown to have a clock face depicting exactly 5 o’clock. SECOND HAND – a spectator thinks of her favourite hour. While the performer turns his head away, the spectator looks at the seconds hand on her own watch. When this hand ticks past her selected hour, she calls out “stop!” The performer turns around, takes out the Timeless deck and shows that there is one card that is facing the other way. It is, say, the Jack of Clubs, and this card has a clock that depicts 1 o’clock, the selected time of the spectator! This effect makes use of a brilliant time force that is sure-fire and impromptu. This force is worth the investment of this product. 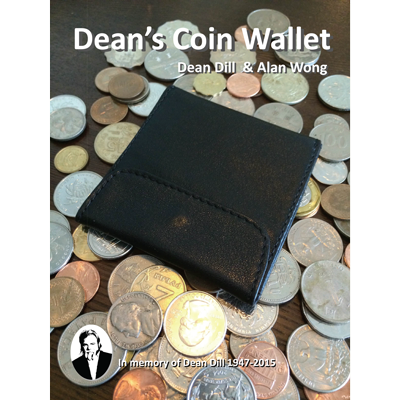 “Dean’s Coin Wallet” is actually a black colour coin purse measuring 3.5” x 3.5” square. It is made in leather and has a flap with a metal snap button. It is a change purse and is therefore double-sided, unknown to the audience. It is said to be Dean Dill’s favourite coin change purse, and was used often by him. Dean used it to switch between gaffed and ungaffed coins or between 2 different sets of gaffed coins. You receive the well-made genuine leather coin change purse. It comes inside a beautiful black box. You also receive a one sheet of printed instructions that contains Michael Weber’s professional routine. In this routine, a spectator names any amount of loose change not exceeding $1. The coin purse is shown to contain that exact amount of coins named by the spectator. By the use of a clever ruse, the purse can be shown to contain nothing else. The purse can be used to switch billets. For example, 4 billets representing 4 outs are in one side of the purse. When the correct billet is taen out, it is then nonchalantly replaced in the other side of the purse, proving the purse to contain nothing else. You should be able to find other uses for this beautiful purse. The Twixter is a card revelation using a Twix chocolate bar. You actually receive 2 artificial Twix chocolate bars, each has the name of a different playing card carved into the base of the bar. They are made of some kind of hard material but look like the real thing. They can be hidden in any part of the clothing and retrieve at the right moment because there is no real chocolate to cause the mess on your clothing. They can both be used in the same performance. Use one to reveal the identity of a selected card. Secretly change it for the other Twix bar and apparently use the “same” bar to reveal the identity of a second chosen card. This can be a double whammy for the same audience. They can be used for different performances, so that you can force a different card for different audiences. You receive a password to download an instructional video featuring the creator himself. You get to learn how to force a card, a side-steal, and a colour change. The video shows how to cause the identity of the card to leave the card so that it becomes blank. Please note that the gimmick (blank face card) is not supplied in the package. It may seem a little strange to the audience that you can retrieve a single Twix chocolate bar from your pocket without the mess made by the chocolate coating. Any part of the clothing is not a good place to keep an unwrapped chocolate bar. Although not mentioned in the instructions, a good way is to purchase the actual Twix chocolate – it comes as a pair inside a wrapper. Tear the end of the wrapper away and consume the 2 chocolate bars. Put the 2 gimmicked bars inside the wrapper, remembering which bar has what card revelation. 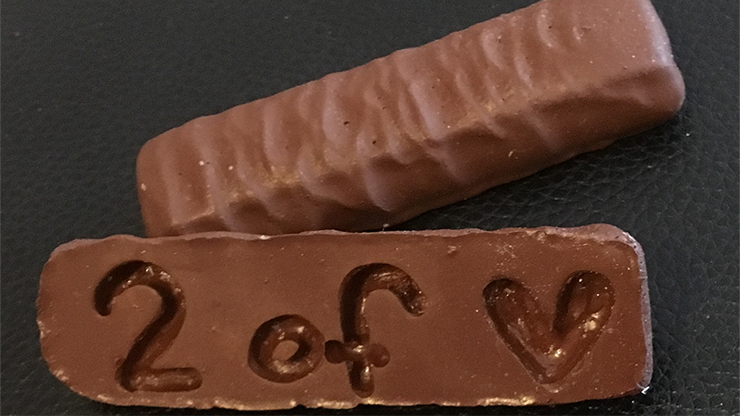 It is more natural to being out the 2 Twixter bars inside the wrapper in this manner to the audience. Paul Brook has written more than 20 books on mentalism, but currently does not have many products out in the market. Cool Beans is one of them. 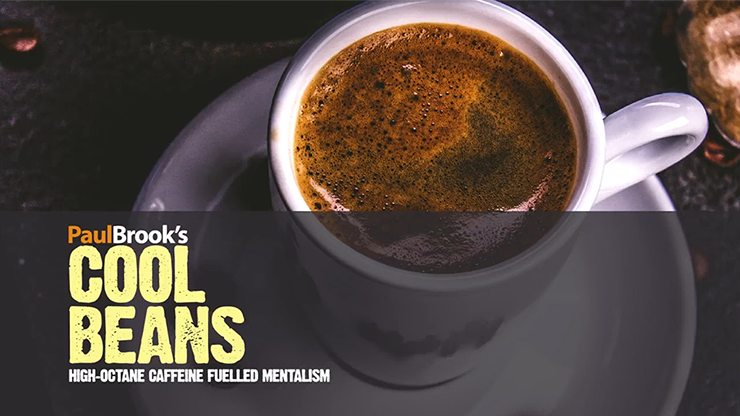 Paul created Cool Beans because of his love for both coffee and mentalism. He also wanted a pocket mentalism effect that uses ordinary objects, has multiple applications, and yet the method is hidden in plain sight. Cool Beans meet all of these criteria. Cool Beans is a set of 5 small stamp cards from 5 different coffee shops. They are the type of cards where you get a stamp each time you visit the coffee shop and spend up to a certain amount. The stamps can then be exchanged for discount or other items in the shops. A spectator selects any one of the 5 coffee stamp cards and put the others away. She is asked to concentrate on either the images or the words on her card. The performer is then able to pick up her “signals” and tells her the actual coffee shop card that she chose. Paul gives 3 different ways of diving the chosen card. You can choose to use any one of the methods you like, and adopt a different one for repeat performance for the same audience. Paul has cunning designed the cards such that all the items depicted in each of them can be used for performance. These include the logo, the name of the coffee shop, its tag phrase, and even the stamps. You can also use the 5 coffee cards for forcing a range of numbers. Numbers are useful to a mentalist – for example, for use in a book test. Paul discusses other subtle uses such as drawing duplications, colour and number reading, and a synchronicity effect involving 2 spectators. You receive the 5 coffee stamp cards. To give them a sense of authenticity, each of them is printed on different card stocks, and the stamps are hand printed. You are also supplied a special gimmick that hides a crib – this means there is nothing to memorise at all. You can download an instructional video as well as a pdf manuscript from the internet that features Paul Brook explaining everything on Cool Beans. When I saw the trailer, the first thing I thought of was, now I can officially get someone to touch my breast, I mean chest 😊. The effect looks really cool and magical. Take a look at the trailer and you will know what I am talking about. Attire is a very short effect, in fact it is good for introducing a sharpie, a lead-in to other effects. It comes with an iron-on that looks like a sharpie cap as well as a gimmick. Before you perform it, you will need to prepare a set-up. The original idea was to really iron it to your t-shirt, but they have since come out with an alternate method whereby you don’t have to iron it permanently to your t-shirt. With the new method, you can perform Attire in any t-shirt, the only downside with any t-shirt is that you will need to do a setup every time you perform. To do the new set-up, you’d need to use a special something which is easily available in art store. Attire really looks like you are pulling a sharpie out of your “pocket”. Besides pulling sharpies out, there are other variation where you can also pull silks out from that “pocket”. I guess you can produce many other items if you are creative enough. 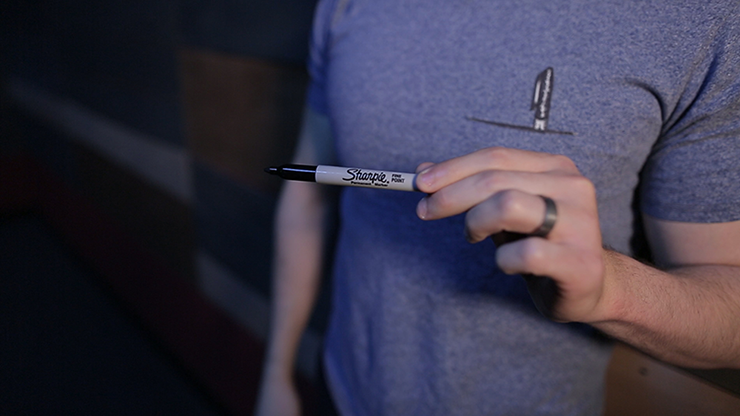 Rather than bringing out a sharpie from your pocket, with Attire, you can magically produce it. This will elevate your status as a serious magician because you just pulled a sharpie out of an iron-on. I truly believe that this will make your performance more interesting. If you often use sharpies in your performances, you should really get this.